I don’t know anyone who doesn’t have at least one well in their heart that needs filled. Often, we’re able to ignore the smaller ‘Wells’ but usually, we’re found sitting on one, holding our bucket, trying to draw from our own selves, healing. We consult self-help books, the stars, our belly buttons, who knows what all, but alas, healing never comes and the emptiness remains and we’re left feeling even more helpless and hopeless. 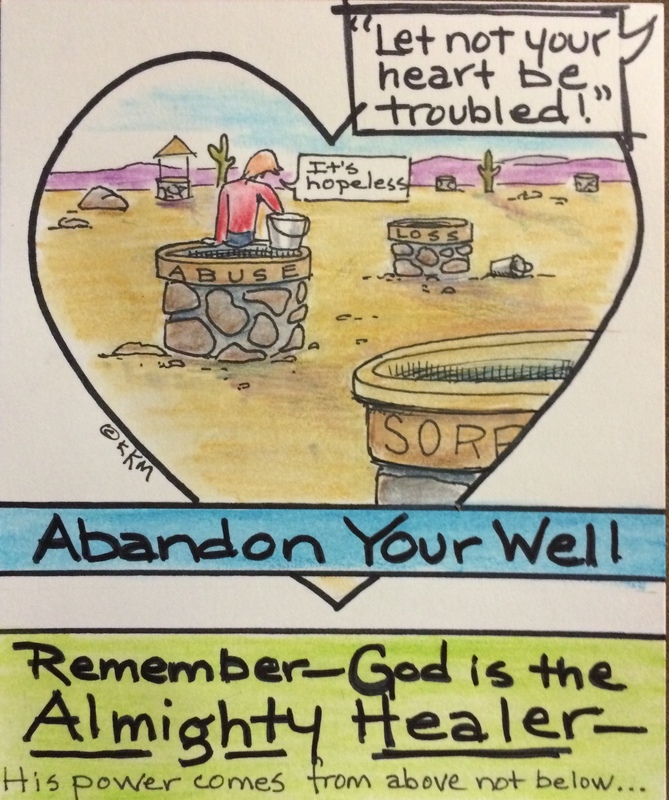 Let God fill your wells with fresh, healing, untroubled waters. Sometimes those self-help books, etc., help us ‘feel’ better for a while, but eventually we are troubled again because we’ve not been filled with pure water. What we drew from ourselves or others was contaminated, poisonous, stale or at best, tepid. Our only source of healing is from the ALMIGHTY GOD whose power and healing comes from above. The water He brings is refreshing, cleansing, peaceful–untroubled. Be prepared–God does not leave one part of your ‘Well of Circumstances’ untouched. From my experience, He digs to the depths (this is often painful), fills to overflowing with peaceful, untroubled water then invites me to dance on the waters with Him. Now that ‘Well’ is a source of strength, encouragement and refreshment for others as well as myself. I visit only to be reminded of how utterly and completely powerful God is and that if He can heal this ‘Well’, he can heal anything that has been, is or ever will be. BE HEALED! Abandon yourself.